Our distinct neighborhoods and bordering commercial centers provide vibrant life for our community. Our roadways and infrastructure are critical to maintaining the connection between where you live and where you shop, dine and work. The Wilmington Pike corridor is the backbone of our community and its vitality is central to the strength of our commercial success. We are investing $10 million, with 95% of funds coming from grants, in infrastructure improvements to this roadway. 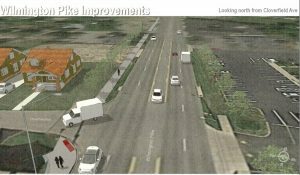 The Wilmington Pike Improvement Committee, a group of business owners and community stakeholders, engaged in a strategic planning process to identify the most important challenges and promising opportunities for this essential corridor. Together with City staff they created a plan to regenerate investment and spur economic development. City Council adopted the recommendations set forth in this plan in December 2013 and we have made progress this year with their implementation. You have likely noticed changes to several commercial properties along Wilmington Pike this year as a result of two recently introduced partnership programs. The purpose of the Demolition Program is to provide financial assistance to commercial and residential property owners in the Wilmington Pike Demolition Program Designated Area to assist in the demolition of structures and clearance of sites for purposes of redevelopment, economic development, removal of non-conforming structures or removal of blight. The City of Kettering Façade & Site Improvement Program is available for exterior building façade or site improvements in the Wilmington Pike corridor in order to bring buildings and site into conformance with the Kettering Zoning Code; removal of blight; and encourage economic development activities. To learn more about the eligibility requirements for both programs call 296-3342. The City of Kettering remains committed to acting as a catalyst for reinvestment in Wilmington Pike for both economic purposes and for the impact the corridor has on our residents as well. 2017 will be another year of major reinvestment in the Wilmington Pike corridor. 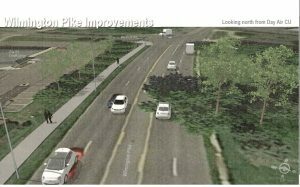 This summer the City will begin major streetscape improvements on the Wilmington Pike corridor between Stroop and Marshall Roads. Both sides of the street will have new streetlights installed and abundant street trees planted. On the west side of the corridor a brand new 8 foot multi-use path will be installed, offering a connection to existing regional bikeways and improved pedestrian access to businesses.